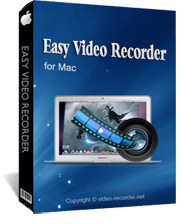 Easy Video Recorder for Mac - Real-time sound recorder software record sounds and music from any source. Record your Mac screen to video with a mouse cursor and your voice. It works well on Mac OS X 10.5 or higher. It can capture Screen, DV Camera, Web Camera, DVD Player, Media Player, QuickTime Player, Web Browser, and other applications. Record all visual and audio activities on your Mac computer in real time. Record with date and time visible on your captured video. Record entire screen, or a particular area of the screen. 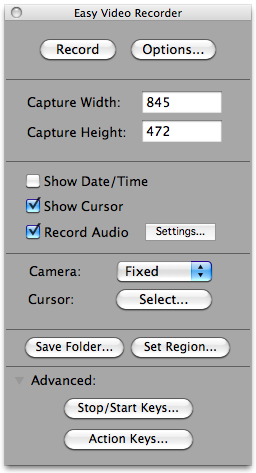 Export captured video to many different file formats including QuickTime, AVI, MP4, MOV, M4V, DV, WAV, 3GP, FLC, etc. Record audio tracks from microphone or speakers or both. Instant video creation. No processing required! Built-in Movie Viewer allows you to play recordings after recording, and contains simple editing features using cut, copy, paste, and clear. Record video playing on your desktop screen, whether it's streaming or non-streaming. Show the user’s mouse cursor in the recorded movie. Video/Audio codec parameter adjustable, such as compression, quality, frame rate, and the size of the final movie. Start, pause, stop video recording with user-defined hot keys. Easily resize a segment of movie. When you resize a segment of your movie, it will change its playback speed. Export any QuickTime compatible movie! Intuitive interface and entirely configurable. OS: Mac OS X 10.5 or higher, compatible with macOS High Sierra 10.13. Copyright ©2002-2016 www.Sound-Recorder.com. All rights reserved.